I finally went to Salumeria 104 for the first time and decided to try a little bit of everything. The restaurant is the newest addition to the Midtown dining row with restaurants such as Sugarcane, Sustain and Mercadito offering some stiff competition. 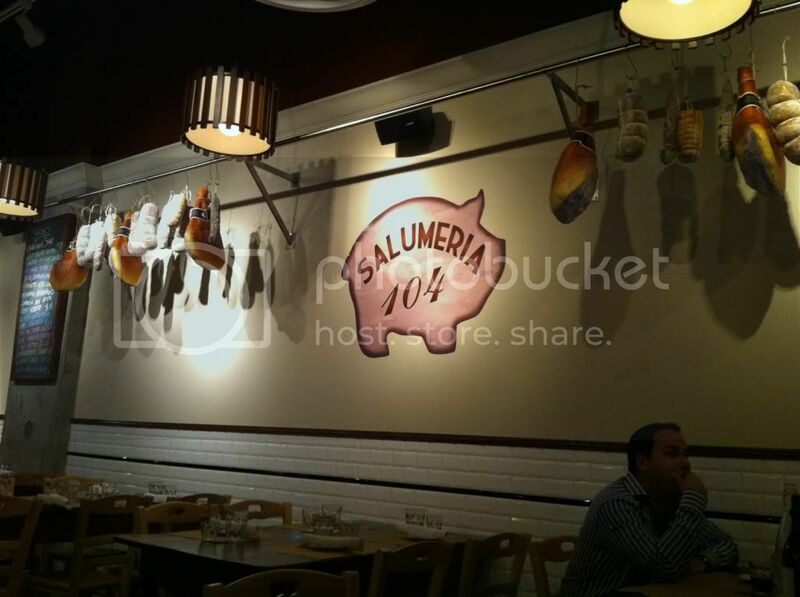 Salumeria 104 is a small bistro that makes you suspend reality for just a minute and allows you to imagine yourself in a deli in Italy. 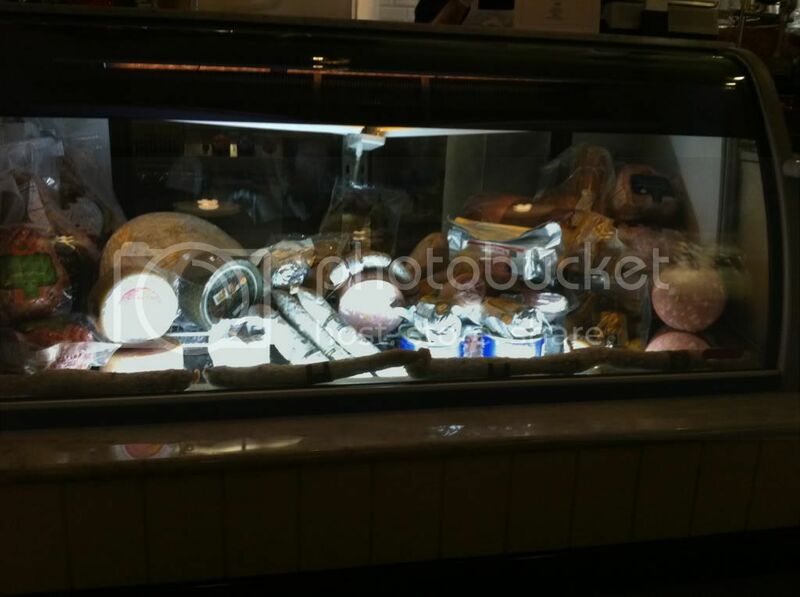 They have their various selection of meats on display for everyone and a relatively open kitchen where you can see chefs running around making your food. Our waitress was pleasant and was able to help us with the menu. We decided to start off the night with a small charcuterie plate (since the place has built a reputation for its imported deli meats). The restaurant offers a "build your own" charcuterie plate with 3 different price points depending on how much you want to sample. We kept it small and decided to just try 3 different salumi. 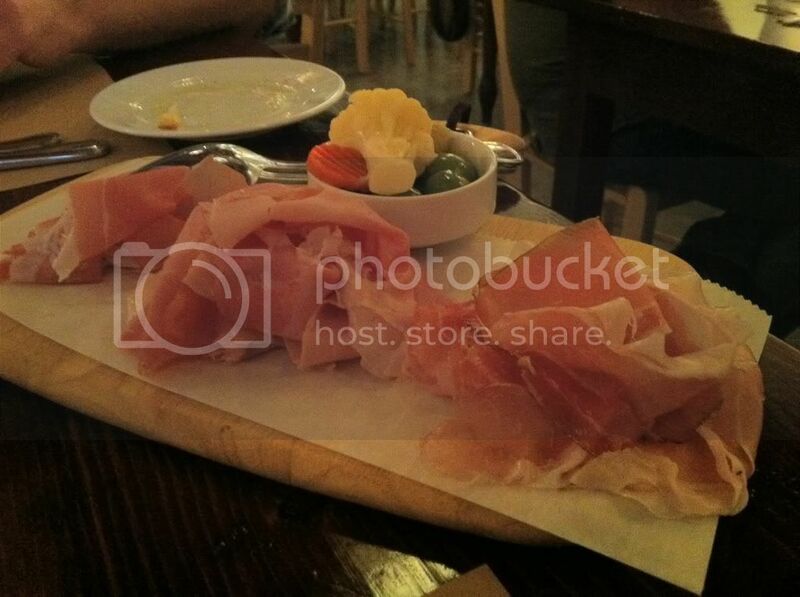 We went with the Prosciutto San Daniel, Speck and Cotto al Tartuffo. All three were delicious and fresh. The speck was great with its slightly salty and smokey flavor, the Proscuitto San Daniel was delicate and really delicious but the Cotto al Tartuffo was the winner for me. Also known as truffled ham, the Cotto al Tartuffo, was perfectly sliced, almost juicy and had rich truffle scent and flavor that permeated through out the entire slice of meat. It was a great treat to start off the meal. Soon after they brought out our charcuterie plate, they also brought out our order of bufala. No we didn't order Italian some buffalo, we ordered their bufala mozzarella and it was some of the freshest mozzarella I've had in a long while. Covered with sliced tomatoes in varying colors and basil leaves delicately placed, this dish was as pretty to look at as it was good to eat. The best bite though was getting some of the meat from our charcuterie plate with the bufala at the same time, mama mia! So far our meal was off to a solid and really promising start. 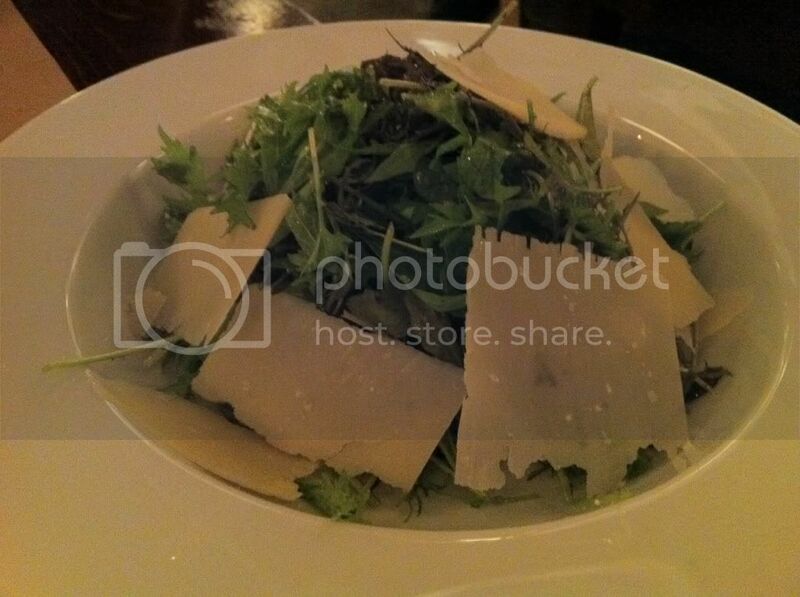 Before starting our entrees, John also had their Verde Del Contadino salad. It was an immensely simple yet delicious salad that consisted of locally grown mixed greens, large slices of shaved Parmesan cheese and a lemon vinaigrette. No over the top fuss with this salad, yet it was refreshing and great none the less. We moved onto our entrees and I decided to go with their pork that was covered in more pork, naturally. 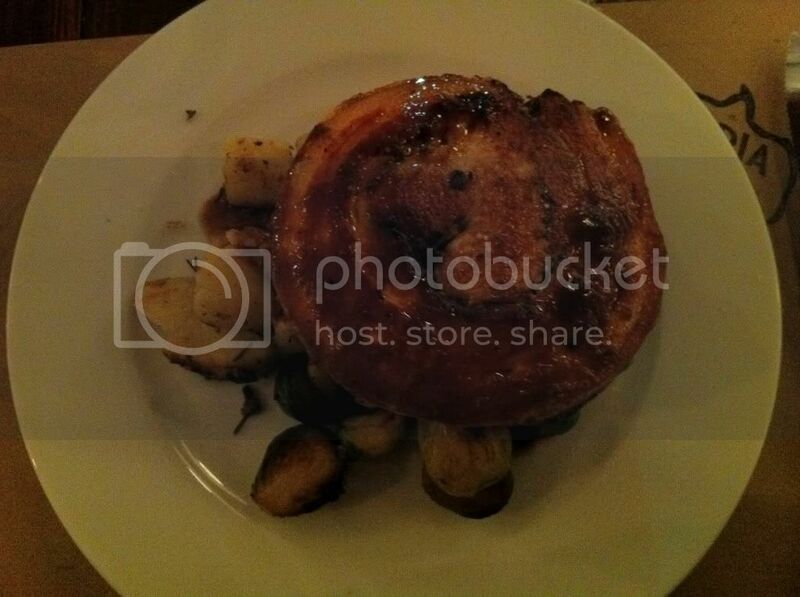 Their Porchetta is roasted pork loin covered in pork belly served over brussel sprouts and roasted potatoes. Holy hell was this dish impressive to look at. It looked like a giant wheel-o-meat and this made me a happy fatgirl. The pork loin was perfectly seasoned and flavorful. The pork belly unfortunately didn't have a lot of stand-out flavor on its own. One issue I did find was that trying to cut through the crispy pork belly with a knife was particularly difficult. It could be because I'm weak, inpatient or part cave man, but I definitely had to fight the urge to grab my wheel-o-meat and just gnaw on it with my bare hands. 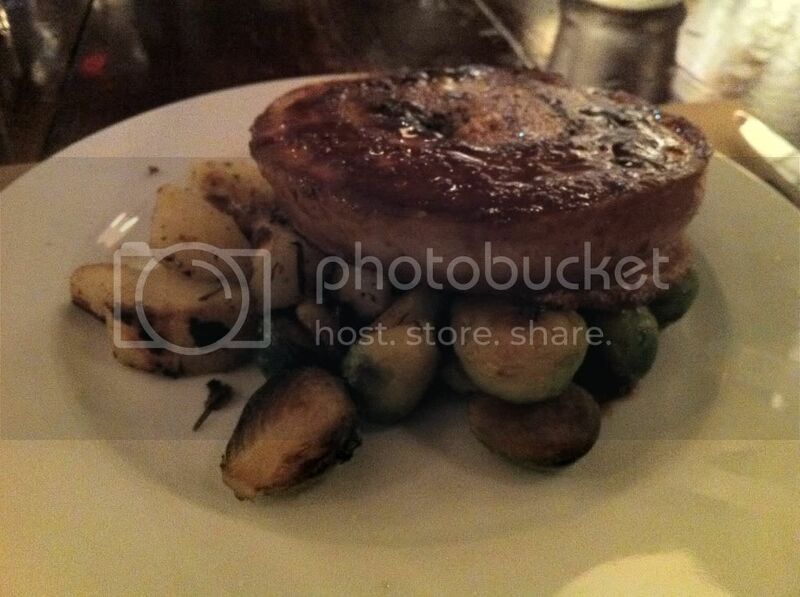 The brussel sprouts and roasted potatoes that accompany the porchetta were very lightly seasoned, letting the ingredients speak for themselves. The potatoes were well cooked; they were very good but nothing particularly unique about them. My brussel sprouts were lightly seasoned as well, perfectly cooked and al dente; I wasn't in a mood for veggies (I'm never in the mood for veggies) and I shared my brussel sprouts with John. My boyfriend decided to have their Gnocchi Alla Romana. 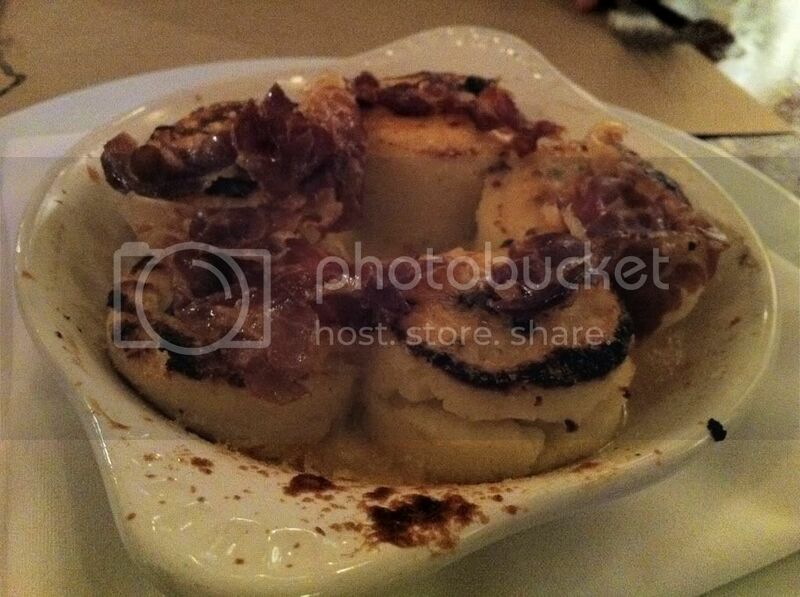 The menu specifies this dish as, "House-made semolina gnocchi with Parmesan cheese and crispy prosciutto." In our mind we were expecting miniature little potato dumplings tossed around in some sort of sauce, the way they are served in the majority of restaurants. What we got, however, was no where near what we were anticipating. They set on the table a ramekin filled with 5 large, light and fluffy "gnocchi." 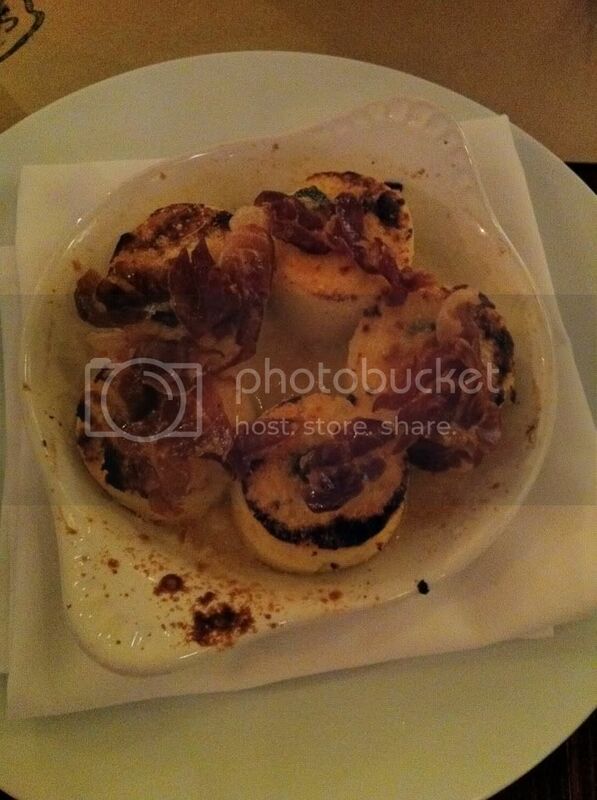 They were topped with crispy prosciutto and melted Parmesan cheese. This was definitely not what we were expecting and unfortunately we were a bit disappointed with the dish. The gnocchi were very under-seasoned and dry. To the point that each gnocchi was completely stuck to the bottom of the plate. 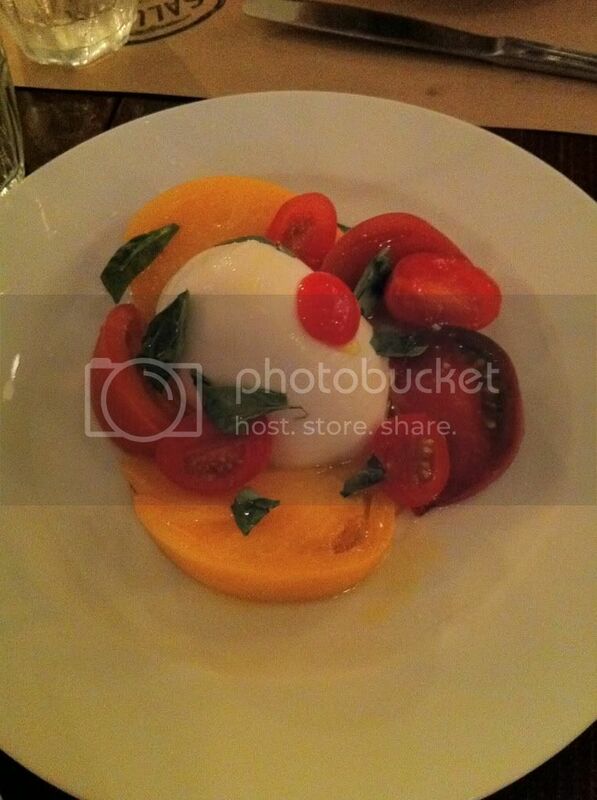 I would definitely like to go back to this restaurant to try their home-made pasta dishes. The hype about their deli meat selection is well deserved. Our charcuterie plate was delicious as was our bufala. 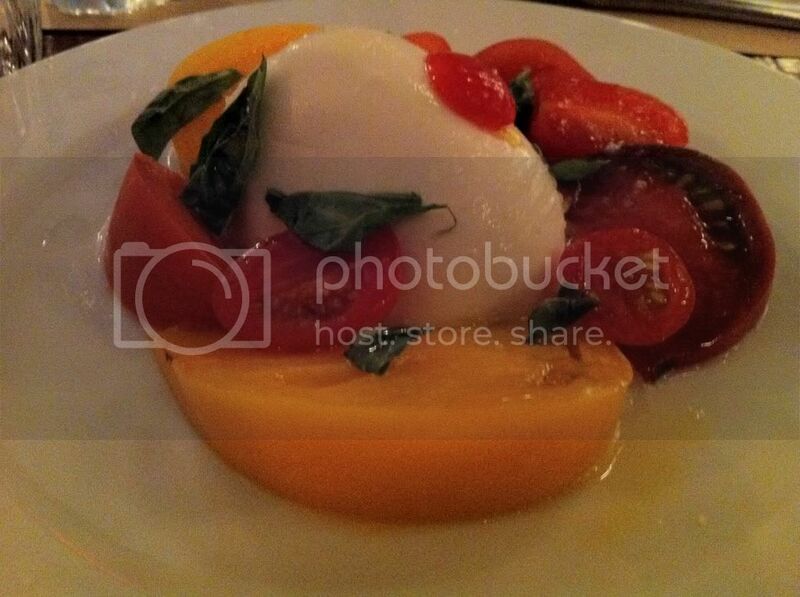 This place brings to Midtown a bit of Italy that was definitely missing. I realize that Italian cuisine is known for its simplistic style and letting the ingredients speak for themselves so I'm rooting for this place and would love to give it a second shot in the near future. It was a sad experience for my family as well. My dad got the same "gnocchi" and it was a severe letdown. My wife had a special of spaghetti with truffle that was horrible. Mushi pasta, under seasoned and full of cream (the pasta was swimming). Super overpriced thanks to the layer of black truffle on top (sliced at the table for show). How can they let a plate of pasta go out like that is beyond me.